To manage risks properly, we must allocate resources to implement a risk management plan. Some resources must be allocated in advance of anticipated risk events, and some must be held in reserve "just in case." Damage to one of the low causeway sections of the Interstate 10 Twin Bridge across Lake Pontchartrain, following Hurricane Katrina in 2005. 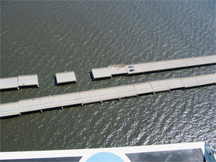 The storm surge brought by the hurricane raised the water level high enough to trap air beneath the concrete causeway's spans, causing them to float off the bridge pier caps. (See Chen, et al., Analysis of the Interstate 10 Twin Bridge's Collapse During Hurricane Katrina). The bridge was built in 1963, when the effects of hurricane storm surge were already understood, though not as well as they are now. Two other nearby bridges, a railroad bridge and the US 11 bridge, withstood the storm with only minor damage. The U.S. 11 bridge opened February 18, 1928. It survived, in part, because its concrete girders are arched, and therefore trapped a smaller volume of air under its spans, reducing their effective buoyancy during the storm surge. Back in 2001, the exposure of New Orleans to hurricane risk was so well known that it was the subject of a superb article in Scientific American (See M. Fischetti, Drowning New Orleans). Moreover, the storm's effects on the bridges were entirely predictable — explaining them entailed no new engineering discoveries. One can easily speculate about how the outcome of Katrina might have differed if resources for risk study and mitigation had been made available, but one also wonders what disasters elsewhere are yet preventable. Photo by Commander Mark Moran, Lt. Phil Eastman and Lt. Dave Demers, NOAA. Courtesy U.S. National Oceanic and Atmospheric Administration. Many organizations have difficulty allocating these resources, especially when resources are thin and risks haven't yet materialized. The temptation to hope that all will go well can lead some to attempt projects with insufficient reserves for risks. And it can lead others to deny that specific risks can ever occur. For example, despite decades of widely accepted predictions, the U.S. government failed to provide adequate resources to New Orleans for hurricane-induced flood risk mitigation and planning. In the project environment, at best, project managers or risk officers identify risks and propose resources to mitigate them. Project sponsors and organizational management then review these proposals for sufficiency and reasonableness. They negotiate with the project staff as necessary, and then they allocate appropriate resources for risk mitigation and management. In many organizations, things rarely work that way. Organizations commit themselves to risk plans that amount to little more than naïve hopes and wishes for the best. How does this happen? In some cases, the available resources cannot cover all identified risks unless everything breaks favorably. When someone identifies a risk that's expensive to manage, risk revision, exclusion, or denial enables those involved to commit to the effort despite resource shortages. When this happens, risks that do materialize can threaten the project — or worse, threaten the enterprise. What can organizations do to manage risk revision? One approach involves adding to the project plan an Appendix of Revised or Excluded Risks — risks that someone proposed, but which were edited before inclusion in the risk plan, or excluded altogether. For each revised risk, the appendix includes the original proposed risk, a revision history with dates, the arguments in favor of and against such revisions, and the names of all involved in each revision decision. The Appendix of Revised or Excluded Risks serves several purposes. If the organization someday decides how particular risk types are to be addressed, the Appendix becomes a useful tool to help project teams bring their projects into compliance. To whatever extent organizational politics or intimidation play any role in risk revision or exclusion, the knowledge that revision decisions will be recorded in the Appendix might deter some intimidators or some who abuse political power to achieve their ends. The Appendix could provide useful data for project retrospectives, or even earlier, if trouble does appear during the project's execution. Would you like to see your comments posted here? rbrenwsekvIbajkAzxVkener@ChacEfQgBdUxGFinZhDJoCanyon.comSend me your comments by email, or by Web form. I offer email and telephone coaching at both corporate and individual rates. Contact Rick for details at rbrenoKdvJfQevZhwnDGEner@ChactYGFBgjqkHHMuKHuoCanyon.com or (650) 787-6475, or toll-free in the continental US at (866) 378-5470.